The capital of Telangana and Andhra Pradesh, Hyderabad is a beautiful city with a regal history. Hyderabad was established by Muhammad Quli Qutb Shah in 1591 and it remained under the control of the dynasty of Qutb Shahi for around a century. It was then captured by Mughals. The Nizams of Hyderabad was the dynasty created by Mughal viceroy Asif Jah I. During the British Raj, the dominion of the Nizams became a princely state. For the next 150 years Hyderabad served as the capital of that princely state. In 2014, a new state called Telangana was formed after splitting from Andhra Pradesh. However, Hyderabad is the capital city of both Telangana and Andhra Pradesh. Hyderabad is now a bustling city with several tourist attractions. The travellers of Hyderabad also have several destinations that are just perfect for a weekend getaway. From temples to caves to waterfalls to hill stations, there are many options for a weekend getaway from Hyderabad. Here are some of the weekend getaways from Hyderabad. Located around 146 km north-east of Hyderabad, Warangal is known as one of the best heritage cities in India. Also known as Ekasila Nagaram, Warangal gets its name from the word Orugallu. Oru means one and Kallu means stone. During 12th and 14 th century, Warangal was the capital of Kakatiya Kingdom. The Kakatiyas ruled for over 200 years. Warangal city was built in the 12th century by Prola Raja of Kakatiya. Many grand structures like Swayamabhu temple and Warangal Fort was built during this period. Warangal was given World Heritage city status by UNESCO in February 2013. The architectural marvels of this city will leave you in awe. The city is also recognised as the Best Heritage City by the Government of India’s Tourism Ministry along with Jaipur. Warangal is famous for its temples, which are known for its history and stunning architecture. One of the biggest tourist attractions is the Warangal Fort, which has a radius of 19 km. The fort is between Hanamkonda and Warangal. There is also a temple inside the fort. The temple is dedicated to Swayambhudevi or the Mother Earth. 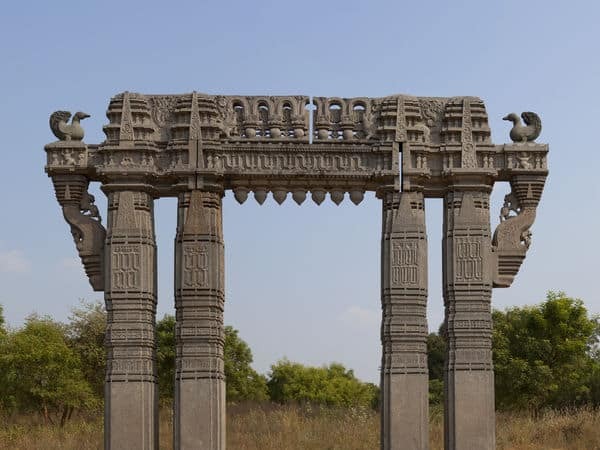 Other tourist attractions in Warangal are the Bhadrakali temple, the Wildlife Sanctuaries at Eturnagaram and Pakhal, the thousand pillared temple and the Pakhal Lake. Warangal has the perfect combination of magnificent monuments and Natural beauty. Things to do: One of the must-visit places is the Warangal fort. The fort is said to be built in the 13 th century curing the rule of King Ganapati Deva. According to archaeologists and historians, Ganapati Deva replaced an earlier brick structure with stone. Gateways, additional circular earthen walls and other structures were added by Prataparudra and Rudramadevi, the successors of King Ganapati Deva. This sprawling fort is constructed between Hanamkonda and Warangal and is definitely the biggest attraction of the city. The fort is known for its remarkable gateway, which is made of four huge pillars carved out of a single rock. The four gigantic stone gateways and the intricately carved pillars and arches are some of the features of the fort that you must not miss. Sadly, the fort is in ruins today. The Pakhal Lake is another tourist attraction in Warangal along with the Pakhal Wildlife Sanctuary that lies on the shore of the lake. The sanctuary is spread over an area of 839 sq km. Established in 1952, the sanctuary is home to bears, leopards and tigers. This place is famous for its natural beauty and is a musty-visit. The Thousand Pillar Temple is located in Hanamakonda. It is dedicated to Shiva, the Sun god and Vishnu. According to legends, the temple was constructed in 1163 AD by King Rudra Deva. The temple includes a star-shaped structure, which is a fine example of the superior craftsman of that period. The pillars of the temple is intricately carved. Best time to go: The best time to visit Warangal is the period between October and March. Where to stay: Hotel Landmark (0870 254 6111), Ashoka Hotel (0870 257 8491) and Hotel Suprabha (0870 257 3888) are some of the hotels in Warangal. Located around 146 km north-west of Hyderabad, Bidar is famous for handicraft products made of silver and other metals, monuments and historical places. This hill-top city is located on the Deccan plateau in Karnataka. It is one of the prominent archaeological places of India. According to a book called ‘Bidar Heritage’ by the state Department of Archaeology, Museums and Heritage, a total of 61 heritage buildings have been listed by the department and out of those around 30 are tombs situated in and around Bidar. The heritage structures of Bidar have been featured in many Kannada and Bollywood movies. One of the important historical structures is the Bidar fort situated on the Deccan plateau. The fort is over 500 years old and is among the biggest forts of India. Constructed in Persian style, the fort encloses Solah Khamba Mosque, Chaubara, Takhat Mahal, Rangin Mahal and Gagan Mahal. You can explore several other historical and religious places in Bidar during your weekend trip. Things to do: The Narasimha Jhira Cave Temple, Papnash Shiva Temple and the Gurudwara Nanak Jhira Sahib are some of the places you must visit in Bidar. You will also see tombs of Barid Shahi and Bahmani rulers around the city. These tombs have beautiful stucco work and paintings. Take a tour of the Bidar Fort, which has several structures inside it. Also the Chaubara, Chaukhandi and the Bahmani tombs are worth a visit. Another thing to do here is shopping. The city is famous for Bidriware, which includes flower vases, dishes, cosmetic boxes, candle sticks and hookahs. Best time to go: The period between December and Februarty is the best time to visit Bidar. You can also visit the city during monsoon (June to September). Where to stay: For accommodation check out Hotel Shiva International (084822 27704), Hotel Sapna Continental (094802 39377), Sai Palace Lodge (084822 26586) and Blackbuck Resort (096638 83104). Tips: Do not forget to buy Bidriware. 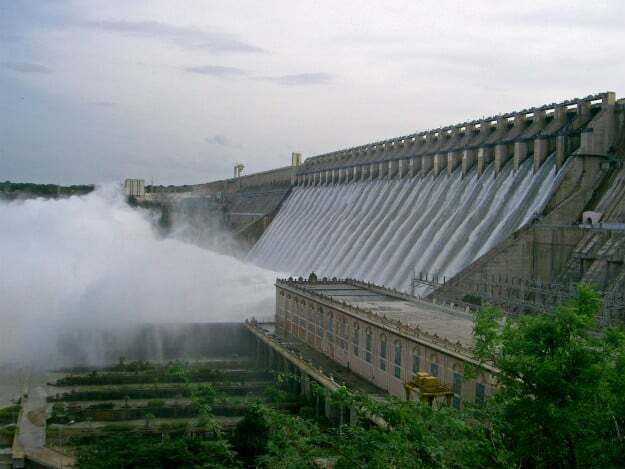 Located around 153 km south-east of Hyderabad, Nagarjunasagar dam is built across the Krishna River. Nagarjunasagar dam is the largest masonry dam in the world. The dam is 490 feet (150 m) tall and 1.6 km long and is an example of the modern architecture of India. You will be mesmerised by the panoramic beauty around the dam. The dam has also created a lake, which is one of the biggest man-made lakes in India. Monsoon is the time when people flock to this tourist attraction to see the gates of the dam open and the water gushing through the 26 gates. The spectacular view of the water falling from a height of more than 100 meters will leave you speechless. Nagarjunasagar was once a Buddhist centre and capital of an old dynasty. The ancient Buddhist monasteries and other structures were excavated from here. It is now preserved in Nagarjunakonda, which is a small island in the middle of the Nagarjuna Lake. Things to do: Visit the Nagarjunasagar dam during monsoon. The sight of water falling from the gates of the dam is spectacular. The dam also offers a sweeping view of the surrounding region. The lake created by the dam is also a tourist attraction. Visit the museum located on the Nagarjunakonda, the small island in the middle of the Nagarjuna Lake. The museum is home to jewellery, coins, statues and other relics of Buddhist civilisation excavated from here. These relics will give you an insight into the lives of the Buddhist people who lived here centuries ago. Best time to go: Monsoon (June to September)is the best time to visit Nagarjunasagar dam. Where to stay: There are few hotels near the Nagarjunasagar dam. These include Vijay Vihar (080 67541834), Samagamam Hotel (8680 277362), Haritha Hotel- Ettipotala (08642-211100) and Punnami Vihar (8680277362). Located about 272 km south-east of Hyderabad, Guntur is a bustling city with rich history. You will find many historical monuments co-existing with the modern structures. There are several museums, parks and nature reserves in Guntur. The Agastyeshwara temple is one of the most famous tourist attractions in Guntur. According to legends, the temple was constructed by Agatsya saint around the Swayambhu linga in the last treta yug. During the time of the construction of the temple, the Nagas were the rulers of the region. Guntur has been known for Buddhism. The region was also the place for the first Kalachakra ceremony, which was held by Gautam Buddha himself. Guttikonda caves or Guttikonda Bilam is another interesting place in Guntur. This historic cave is located approximately 3km south of Guttikonda village. You can also visit Sitanagaram, which is a small village on the bank of Krishna River. Things to do: One of the must-visit places near Guntur is a village called Uppalapadu. 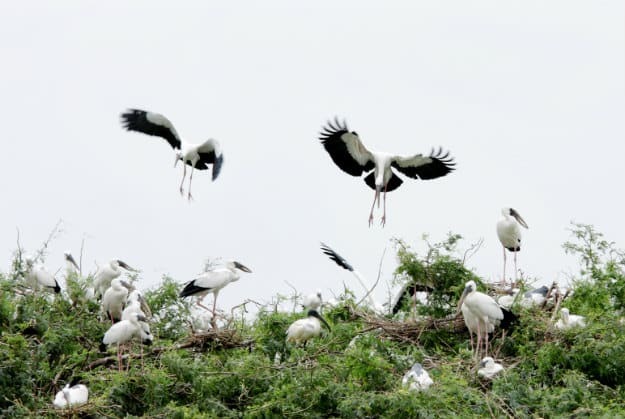 It is a bird sanctuary and is home to around 40 species of migratory birds like white ibis and pelicans. You can visit Kondaveedu Fort, which has several temples, 21 stupas, pillared halls and beautiful gateways. You will have to trek up a hill to reach the fort. Undavalli caves are another place you must expolore. Built during the 4th and 5 th century, the caves have been carved out of a hillside. These caves include Narisimha Swamy temple and Anantapadmanabha Swamy temple. Best time to go: October to March is the best time to visit Guntur. Where to stay: Amaravathi Hotel (0863 223 1750), Hotel Sindoori (093971 19377), Rcr Orchid Business Hotel (0863 663 3456) and Grand Nagarjuna Hotel (0863 226 4211) are some of the best hotels in Guntur. 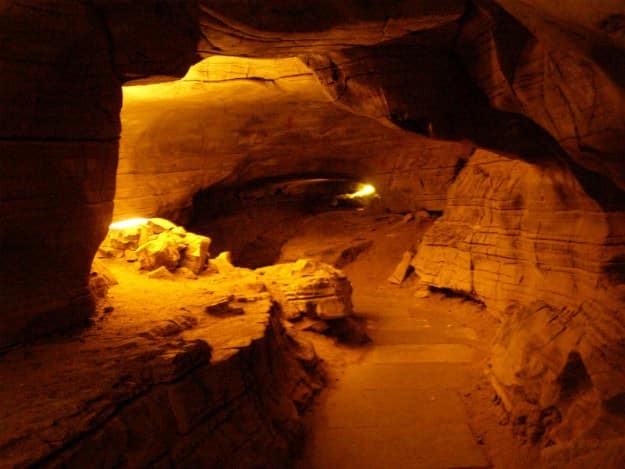 Located 365 km south of Hyderabad in Kurnool, Belum caves are the longest caves in plains of Indian Subcontinent. The caves are 3229 meters long and have smooth walls and huge chambers. As you explore the caves you will find many interesting features. The caves were used by Buddhist monks for meditation. A perennial stream flows deep in these caves and is called Patalaganaga. There are different formations of stalagmites and stalactites inside the caves. Some of these structures produce musical sounds. These stalactites and stalagmites formations give these caves a surreal look. The caves were created naturally by the constant flow of water. It is the second biggest natural caves in Indian Subcontinent. Megahalaya’s Krem Liat Prah is the largest. These caves, which are made of Black Limestone, were declared protected by the state government in 1988. In February 2002, the caves were developed as a tourist attraction by the Andhra Pradesh Tourism Development Corporation (APTDC). Tourists can access only 1.5 km of the caves. The caves have 16 different pathways and quartz deposits. Near the Belum Caves, there is a huge statue of Buddha. Things to do: You can explore the caves and see various formations. The natural beauty of the caves is indescribable. You can also see the places where monks used to live. The spiritual ambience of the cave will calm you. You can visit the caves on all days of the week between 10am and 5pm. The ticket price for Indian adult is Rs 50 while foreigners will have to pay Rs 300. Best time to go: You can visit this place throughout the year but the best time to visit the caves is during the winters. Where to stay: You can either stay in Haritha Belum Caves operated by APTDC or one fo the hotels in Kurnool. The accommodation options include The Mourya Inn (085182 24999), Sign Regency Hotel (098498 46569), Hotel Suraj Grand (085182 57999) and Hotel DVR Mansion (085182 21111). Karimnagar is located 163 km north of Hyderabad and is a beautiful city on the banks of Manair River. The city is a famous pilgrimage site with several temples. Once a centre of vedic learning, Karimnagar is now a popular getaway from Hyderabad. Archaeological excavations have proved that it is an ancient city. The city is famous for silver filigree, which is a striking craft. This art is over 400 years old and is still practiced here in Karimnagar. You can buy household items and jewellery made in a filigree style. There are several handicraft shops that sell these products. Things to do: Visit the Elgandal Fort. This hill fort was constructed during the reign of Kakatiyas. It was the stronghold for Recharla padmanayaks and Musunuri Nayaks. 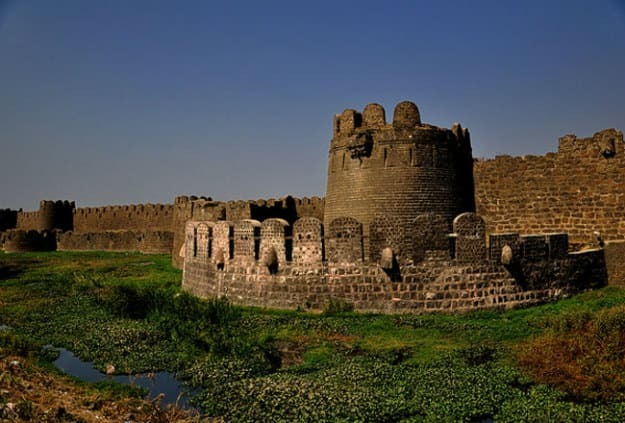 In the 16 th century the fort was under the control of the Qutb Shahi dynasty and Quinamul Mulk was the commander. Later, the fort fell under the Mughals and Amin Khan was the Khiledar during the period of Nizam of Hyderabad. During the rule of Nawab Salabat Jung, Mirza Ibrahim dhamsa was appointed as the Khiledar and he rebuilt the fort in 1754 to strengthen it. 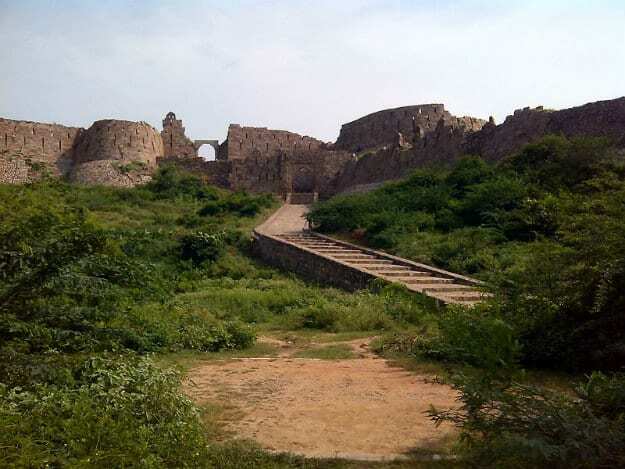 The fort is one of the places you must visit during your trip to Karimnagar. Other tourist attractions are the Sri Raja Rajeshwara Swamy Temple, Mukteshwara Swamy Temple, Kondagattu and Dharmapuri. Deer park and the lower Manair Dam are also popular among tourists. Best time to go: Winter season (October to March) is the best time to visit Karimnagar as the climate will be pleasant. Where to stay: Some of the best hotels in Karimnagar are Hotel Swetha (0878 224 4333), Hotel Nawab's (097044 11303), Srinath Residency and Maitri Residency (0878 224 1666). Tips: Do not forget to take home some of the silver filigree items. Bijapur is located in Karnataka, 364 km west of Hyderabad. This medieval city was once the capital of Bijapur Sultanate. 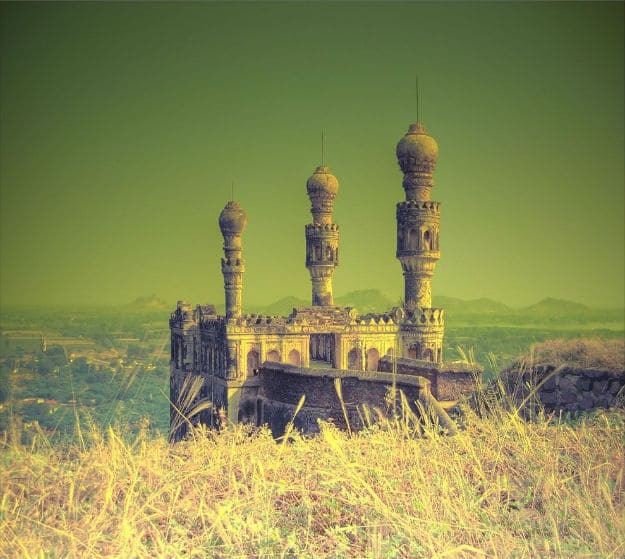 Famous for its gardens, forts, historical monuments and mosques, Bijapur is now called Vijayapur. The city was established by the Kalyani Chalukyas in the 10th and 11 th century and is was called Vijayapura, which means the city of victory. This ancient city is the land of different culture and five rivers. The Chalukya kings ruled this city during the period between 11 th and 12 th century. Later, the city was renamed as Bijapur the reign of Bahamani Sultanate of Gulbarga. Bijapur flourished under the Adil Shah dynasty. It was the golden period of Bijapur. Yusuf Adil Shah was the founder of the Adil Shah dynasty in the 15 th century. UMost of the architectural marvels that you see today were built during the reign of the rulers of Adil Shah Dynasty. These monuments are still in good condition and attract tourists from across the country. The city has over 20 musoleums, 50 mosques and many religious places that are the testimony of its regal past. 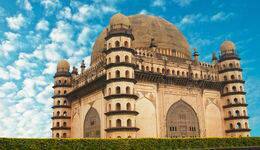 One of the most popular tourist attractions is the Gol Gumbaz. Other attractions include Ibrahim Rauza, Upri Burj, Gagan Mahal and Chand Bawdi. There are several gardens in the city that are worth exploring. Bijapur is also home to world’s largest cannon of the medieval period, Malik-e-Maidan. You have to see this cannon to appreciate its size and beauty. In 1686, Aurangzeb took over Bijapur ending the reign of Adil Shah. Later, Bijapur was captured by Maratha and eventually fell into the hand of British. 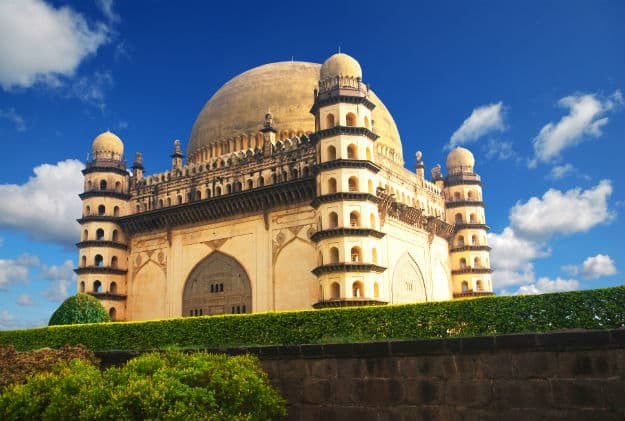 Things to do: Your visit to Bijapur is incomplete without a trip to the famous Gol Gumbaz. 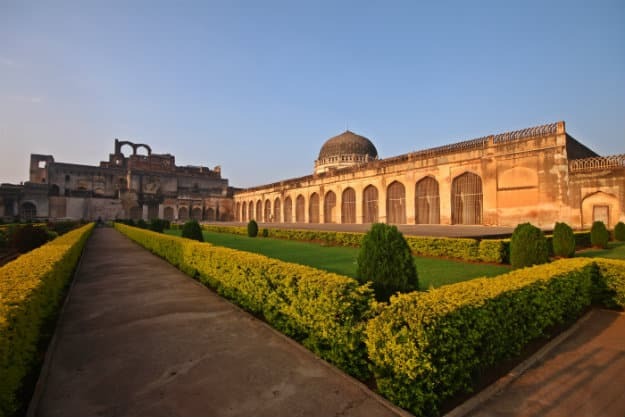 The tomb of Mohammad Adil Shah, Gol Gumbaz is Bijapur’s largest monument. Gol Gumbaz has the largest dome ever constructed in India. The monument is built in such way that every sound echoes in the central chamber. Even the faintest sound in the Whispering Gallery can be clearly heard at a distance of 37 meters. The monument also includes ruins of a mosque, old guest houses and a hall for trumpeters called the Naqqar Khana. An archaeological museum is located near Gol Gumbaz and it has several objects like paintings, sculptures, weapons, inscription and manuscripts. The museum is operated by the Archaeological Survey. Another place important monument in Bijapur is King Edward VII Memorial. The memorial has a tower with a bust of King Edward VII. Located in the heart of the city, the memorial has Indo-Islamic architecture style. The memorial is usually compared with Lalbaug and Cubbon Park in Bangalore. The memorial once has a beautiful park but it was destroyed due to government’s mismanagement. Today the memorial is in the state of ruins. The largest cannon in the world during medieval time, Malik-e-Maidan, is another interesting thing you must see in Bijapur. The 4-meter long cannon weighs 55 tons. It was brought to Bijapur in the 17 th century from Ahmadnagar as a trophy of war. It took ten men, 10 elephants and 400 oxen to bring the canon to Bijapur. According to the engravings on the cannon, it was given by a Turkish Officer who worked under Burhan Nizamshah. The nozzle of the cannon is shaped as lion’s head with open mouth. The canon was placed on a special platform called the Sherza Burj. It is believed that the gunner would go underwater in a tank after igniting the cannon to escape the deafening explosion. The cannon is placed in a tower located to the north of Phatka. Ibrahim Rauza is the tomb of Ibrahim Adil Shah II. Built on a single rock, the tomb is famous for the symmetry of its features. It is believed that this tomb was the inspiration behind the iconic Taj Mahal. Chand Bawdi is another tourist attraction in Bijapur. Built by Ali Adil Shah, the water tank is named after his wife Chand Bibi. The tanks, which has a capacity of around 20 million litres, was built to help the migrants in the city. There are several structures around the tank. Best time to go: You should visit Bijapur between October and March. The weather during this period is suitable for sightseeing. Where to stay: Several accommodation options are available in Bijapur. Some of the best hotels are Hotel Pearl (083522 56002), Hotel Kanishka International (083522 23788), Hotel Basava Residency (083522 43777) and Hotel Pearl (083522 56002). Tips: The food offered by Bijapur is a fusion of Chinese, South Indian, Mughlai and Hyderabadi cuisines. Do taste the mouth-watering dishes here. Located 212 km west of Hyderabad, Gulbarga is a city in Karnataka. Gulbarga is also known as Kalburgi. It was once under the reign of Nizams of Hyderabad and has several historical structures with Islamic architecture style. Sharanabasaveshwar Temple, Ferozabad fort, Tomb of first Bahmani Sultan Hasan, Sri Hulakantheshwar Temple and Bahmani fort are some of the attractions in Gulbarga. The Ghathargi Bhagayavanti Temple located on the banks of Bhima River is also popular. Things to do: You can visit the Chandrampalli Dam, which is built across Bhima River for a one day trip. There is an island near the dam where you can indulge in activities like trekking and camping. A Hanuman temple sits on top of a hill close by. One of the interesting places to visit in Gulbarga is the Chor Gumbad. The structure is known for its environmental setting and fine stucco. The tomb is located on the western side of the Gulbarga fort. You will see some beautiful jails, which are now broken, and stucco on the ceiling of this lone tomb. Chor Gumbad is probably a victory monument as it does not have a grave inside it. A flight of stair leads you to the upper corridor. The roof top has structures resembling miniature tombs with small minarets and domes on the four corners. The Fort of Gulbarga is in ruins but is still a must visit. The fort complex includes several interesting building. Jama Masjid is one of the buildings inside the fort. The masjid was constructed in the late 14 th century. It has 75 tiny domes and one huge one with four smaller domes. There are many religious places in Gulbarga like Sheikh Roza Dargah, Buddha Vihar, Sharana Basaveshwara Temple and Khaja Bande Nawaz Dargah. Best time to go: October to March is the best time to visit Gulbarga. Where to stay: Some of the best hotels in Gulbarga are The Central Park Hotel (084722 73231), Hotel Aditya (084722 24040), Hotel Heritage Inn (084722 24093), Lumbini's Grand Hotel (084722 23100) and Hotel Meridian Inn (080503 84880). Located 305 km north of Hyderabad, Adilabad is a historical city. It has been ruled by dynasties like Asaf Jahis, Qutub Shahis, Chalukyas and Mauryas. The city got its name from Yusuf Adil Shah, the erstwhile ruler of Bijapur. Originally, Adilabad was called Edlabad when the city was under Qutub Shahis. Presently, the city has multicultural society with Bengali, Telugu and Malayali and Marathi people living together. There are many weekend getaways from Adilabad. Some of the popular tourist attractions of Adilabad include Mavala Lake, Shivaram Wildlife Sanctuary and Pochera waterfall. Things to do: Enjoy the beautiful Porcha waterfall, which is located close to Adilabad. This picturesque waterfall is huge and is very deep. Be cautious while approaching the waterfall. Shivaram Wildlife Sanctuary is one of the delightful places you will visit in Adilabad. Known for its natural beauty the sanctuary is spread across an area of 36.29 sq km. Established in 1987, the sanctuary is famous for fresh water crocodiles. Sathnala and Kadam Dam are among the popular tourist destinations. Gnana Saraswati temple is another major tourist attraction is Adilabad. The temple is located at Basar on the banks of Godavari River. The temple is famous for the learning ceremony, which is known as Akshara Abyasam. Children are brought to the temple for this ceremony. Best time to go:The best time to visit Adilabad is between October and March. 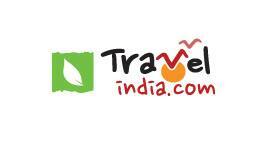 Where to stay: There are many accommodation options in Adilabad. Some of the best hotels are Punnami Basara (094904 09944), Indraprastha Basara Resort Hotel (080082 00690) and Hotel Raviteja (098480 82999).